Inspired by the lifestyle and rich culture of indigenous Bhutanese people, Village Lodge is admirably constructed in true Bhutanese essence. 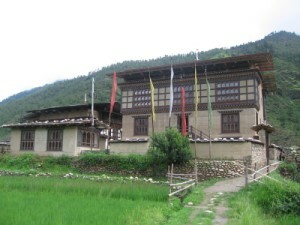 Located only a few minutes drive from Paro airport and set on the fertile farmland in the middle of vivid Paro valley amid richly forested hills the lodge offers exquisite traditional experience and luxurious accommodation in a peaceful Himalayan environment. There are nine suite rooms elegantly decorated in Bhutanese architecture and equipped with underground heating system with bath tub and bathroom. The Restaurants and Bars include a Multi-cuisine restaurant serving local, Continental and Asian delicacies; NUTS Bar offers the selection of international and Bhutanese beverages.